Just because most newborns don’t have teeth yet, it’s never too early for new parents to start a dental regimen for their baby. During the pregnancy: A child’s dental care really starts before the child is born. Baby teeth begin to form before birth, so pregnant women should make sure to eat a balanced, nutritious diet and should get an adequate amount of vitamins and minerals. They should have a complete dental exam and have any cavities or gum disease treated. After birth, but before teeth arrive: Before the baby’s teeth have even erupted, keep the baby’s mouth clean by wiping down the gums twice a day with gauze or a moist washcloth after the baby’s last feeding. At about six months, teeth begin to come in: Parents should start brushing their children’s baby’s teeth as soon as they come in. The American Dental Association (ADA) recommends using fluoride toothpaste the size of a grain of rice on a child-sized toothbrush twice a day. At age three, a full set of baby teeth have probably arrived – 20 of them – at which point the ADA recommends upping the amount of toothpaste from the size of a grain of rice to the size of a pea. Around age six , most children should be able to brush on their own. At this point, children can start using an adult-sized amount of fluoride toothpaste when they brush. Children should have their teeth flossed as soon as two teeth are touching. Children typically can floss on their own starting at about 7 years old. 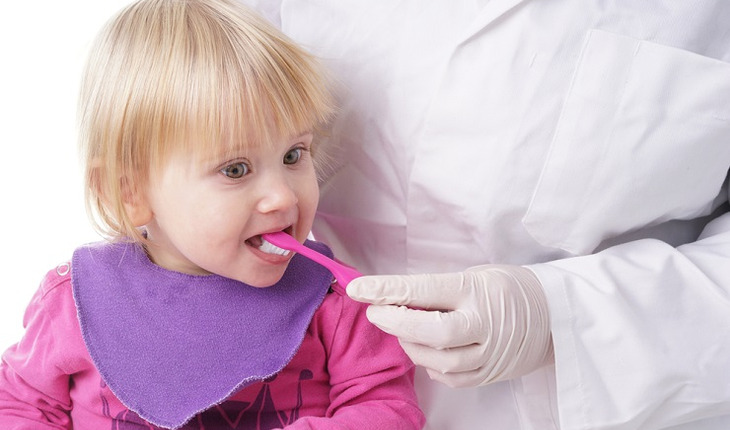 The first dental visit: The American Academy of Pediatric Dentistry recommends an initial visit to the dentist when the first tooth erupts, or no later than baby’s first birthday. From then on, parents should make twice yearly visits. When children should see an orthodontist: The American Association of Orthodontists recommends all children see an orthodontist by the age of 7. Even though it may sound early, some issues can be addressed more quickly when caught early, such as issues with the growth of the jaw bone, remaining baby teeth, impacted teeth, the number of teeth growing in, and more. Fortunately, the majority of children this age will not need treatment. One of the most important things parents can do is model good oral health behavior so children can see how seriously their parents take care of their oral hygiene. It’s important that children see their parents brush and floss, avoid sugary snacks, and make regular visits to the dentist.